Take a time machine back 100 years to 1914. What would the field of radiology look like? That’s exactly what the RSNA  organization is asking participants at this years’ annual conference, Nov. 30 – Dec. 5, in Chicago, as the professional society kicks off their ambitious yearlong centennial anniversary  of their annual meeting. If you have been to the RSNA conference at the sprawling McCormick Place, it’s hard to imagine what the event looked like in 1914. I doubt pictures exist of that inaugural meeting, but it was probably little more than a dozen bearded doctors sporting monocles and top hats. What we can be sure of is the only radiology technology available at the time was the original x-ray, which was invented in 1895 by German physicist Wilhelm Röntgen (pictured). I imagine the prospect of seeing inside the human body without surgery was absolutely thrilling for physicians of that era. It’s easy to see the advancements made in imaging technology the past 100 years, most of it occurring after 1960 when computers became more widespread. 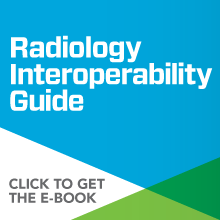 What about radiology data interoperability over the past century? Radiology is unique in several ways. First, radiology departments are often smaller than hospital IT staff, so they deal with every IT issue inside the facility. But that also means IT staff are very innovative and looking for new ways to solve problems. Second, many radiology practices have either merged with larger radiology practices or health systems or fold completely because they didn’t make the necessary adjustments after HITECH and the Affordable Care Act were passed. How far have radiology clinics and practices progressed in their ability to send and receive orders and results with other departments and external providers? Your answer will likely vary depending if you’re a glass half empty or full guy or gal. We’ll take a look at both viewpoints. Considering that radiology has been using some sort of electronic health record system for longer than any other specialty – PACS Picture Archiving Communication Systems (PACS) are devoted to the storage, retrieval, distribution, and presentation of images. The medical images are stored in an independent format, most commonly DICOM. Synonyms: Picture Archiving Communication Sys... systems are used throughout the field and are considered to be in the “mature stage” according to research firm IMV – their systems and practices are still very much siloed or separate. Radiology technology was developed solely for radiology and EMR Electronic Medical Record (EMR), as defined in Defining Key Health Information Technology Terms (The National Alliance for Health Information Technology, April 28, 2008): An electronic record of health-related information on an individual that can be.../EHR systems were designed without much consideration for RIS Radiology Information System (RIS) is the main application in an imaging center or radiology department. RIS is used by to store, manipulate and distribute patient radiological data and imagery. RIS are used for patient scheduling, tracking, and imag... connectivity, not unlike hospital-to-hospital systems today. From the point of view of Meaningful Use, radiology was seemingly left out since the first stage focused on EHRs and EHR Electronic Health Record (EHR), as defined in Defining Key Health Information Technology Terms (The National Alliance for Health Information Technology, April 28, 2008): An electronic record of health-related information on an individual that conform... adoption. However, the ONC Office of the National Coordinator for Health Information Technology (ONC) – Located within the Office of the Secretary for the U.S. Department of Health and Human Services (HHS), the Office of the National Coordinator (ONC) coordinates nationwide ... clarified the rules and it became financially feasible for radiology to attest for Stage 1. It remains to be seen, however, if Stage 2 is worth the investment because radiology practices will be unlikely to use Consolidated CDA Clinical Document Architecture (CDA) HL7 CDA uses XML for encoding of the documents and breaks down the document in generic, unnamed, and non-templated sections. Documents can include discharge summaries, progress notes, history and physical reports,... documents or Direct Project The Direct Project was launched by the ONC within Health and Human Services (HHS) on March 1, 2010. It was initially called NHIN Direct. The object of the Direct Project is to replace the use of faxes, phones, and paper transactions with a simple and... protocol. Half-empty conclusion: More could have been done to consider radiology in Meaningful Use plans, and many of the current changes in healthcare appear to be designed to put radiology in the crosshairs as the industry inches away from the fee-for service model to the accountable care model proposed in the Affordable Care Act. DICOM Digital Imaging and Communications in Medicine (DICOM) is a common format for image storage. It allows for handling, storing, printing, and transmitting information in medical imaging. Visit DICOM website. Synonyms: Digital Imaging and Communications... order integration: Strip patient information out of DICOM header and use to automatically enter orders into the RIS. Preserve existing workflows: Take integrated orders, parse the data, and populate a PDF that mimics previous order forms that are familiar to the RTs. Employ and integrated, web-based order-entry system: Referring physicians and their staff enter patient information in a secured website that automatically populates the RIS. Front desk staff are then notified of new orders and follow standard scheduling procedures. Sync front desk scheduling and order entry into RIS. Integrate multiple sites’ dictations systems (Powerscribe 360) into primary database. Return order results to referring physicians with customized templates, providing consistency in information and design. Return ORU messages in a data format that can be integrated into all major EHR systems. As we follow RSNA’s guidance to look back at the last 100 years, there are valuable takeaways in regards to data integration that can be used to succeed in the future. To survive and thrive, connecting to the referring community is a must. And, to integrate internal applications and preserve workflow, all it takes is a little creativity, the right technology , and a determination to succeed to find success that provides a strong ROI and also leads to decisions that can provide better patient care. I especially look forward to 2015 when RSNA has asked us to look to the future of the profession. For data integration, the foundation laid today will lead to a wide-open future. If you will be at RSNA 2014, stop by and see us at booth 3216 in South Hall A.